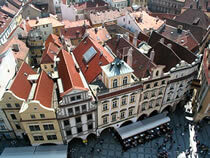 FREE TOUR: Book a hotel or apartment through Prague Experience and get this tour free for everyone in your party. The Discover Prague Walking Tour is a short introduction to Prague, for your first full day in this beautiful city. Explore with us the main sights and attractions around the Old Town Square and Wenceslas Square, and learn interesting facts to help you get the most out of your Prague trip. As we make our way round the very heart of Prague, our friendly local guide will explain the layout of the city and outline how the public transport system works. We offer you our tips as well on where to shop and what to buy. Importantly, we also advise you where and what to avoid, to help ensure your trip runs as smoothly as possible. And you'll get a free map of Prague, to help you navigate your way around the city on your own. Guided tour of Prague + Prague map.